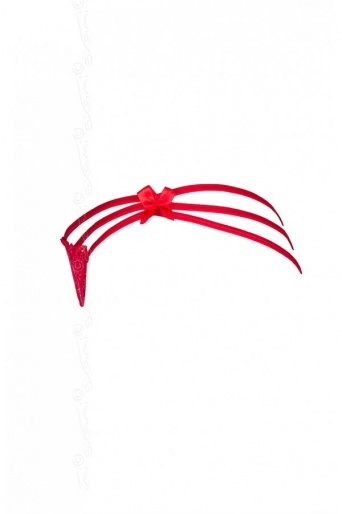 Delicate lace string that has a soft red lace front panel with a diagonal line that has a scallop edge and exciting strappy rear design. The gusset is cotton lined with a cover of red tulle that has a tiny polka dot pattern. The same tulle is used to infill the rear central diamond formed as the elastric straps cross each other. 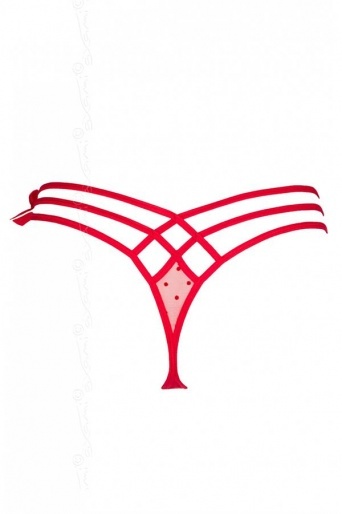 The Carina string by Axami is an intricate design and an alluring little garment. Ideal as a small gift on its own or combine it with any of the red designs within the Eclissi di Luna collection. 56% Polyamide, 6% Elastane, 20% Cotton and 18% Polyester. Check your size here. Measurements in cm are shown below the UK size.